filled this void in my preK environment. is very appealing to the children in my program, and a great way to teach letter recognition, letter shape, phonics, etc. 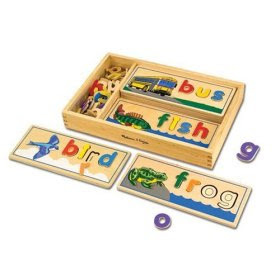 Each wooden “card” has two sides, totaling 20 words in all children can spell. The words are all high frequency, three and four letter words. This toy is recommended for children 4-7 years old; however, I have found that younger children really enjoy it too, especially with a little bit of scaffolding. Parents can limit the letter choices for very young children to ensure their success. Of course, young children require close supervision for choking hazards. The letters are large, but they say that anything that can fit though an empty toilet paper roll is a choking hazard. For my six-year-old daughter, the toy is too simplistic to sustain play when no longer novel. « Daily Tip: Lower the Thermostat and Put On a Sweater! This isn’t really a comment on M&D toys. Though, I do love your recommendations and you have given me some great ideas. My comment is more about China and fair labor,etc. While I do mind buying products made in China, I mind less if the company practices Fair-Wages, labor, etc. It’s nearly impossible to make our all purchases China-free. When making clothing purchases, I browse the site and research their polcies. Lands End and LLBean, Ergo Baby Carrier, etc. state their products are being made in the fairest way possible and only age appropriate labor allowed, etc. I sent your questions to Melissa and Doug. Their website is quite sparse on the subject. Most of the information I have found about M and D is on other blogs, which I provided the links to above.